Last One In Stock = An Unbelievable Deal !!!! New Trellis frame: The new Hypermotard family of bikes is equipped with a new tubular steel Trellis frame with 34 mm main section tubes, 25.5° rake, 104 mm trail and 30 mm offset, dimensions which allow steady and safe control without compromising the agility typical of this motorbike. The frame connects into the seat rail and, as in the new Multistrada 1200, includes an intermediate section in engineering polymer. A wide 70° steering angle allows great handling, while the wheel base has been increased to 1500 mm to maximise stability at high speeds. Touring ergonomics: With the wider and more comfortable Touring seat set at a height of just 850 mm and the handlebars raised by 20 mm, the new Hyperstrada further improves the rider's comfort and position so long distances can be covered, even with a passenger, in complete comfort. 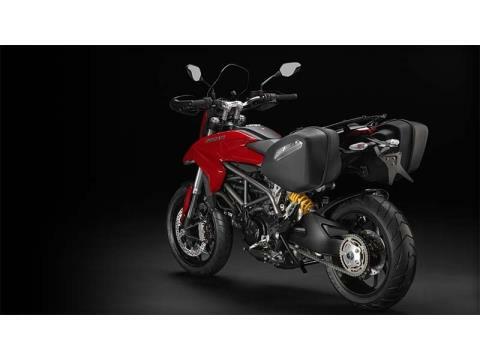 New fuel tank: The fuel tank in the new Hypermotard family has been completely redesigned and its capacity increased to 16 litres (4.6 litres more than the previous models), guaranteeing a greater range without affecting the bike's fundamental and sinuous lines. Bosch-Brembo braking system: The front braking system features a pair of the new double Brembo M4.32 monobloc 4-piston radial callipers, which are activated by the brake master cylinder with its 4-position adjustable lever on the Hypermotard and Hyperstrada and by the radial brake master cylinder with an adjustable 5-position lever on the SP model. The front discs are 320 mm, while on the rear there is a single 245 mm disc with a single Brembo calliper. All the new Hypermotard models are also equipped with the new multilevel Bosch 9MP ABS as standard that make braking safe and effective in any road conditions. This component ensures optimum braking performance in the sector, a typical feature of every Ducati. Sachs monoshock with remote adjustment: The rear suspension includes a Sachs monoshock which is easily adjustable in remote hydraulic braking in extension and preload, which allows rear wheel travel of 150 mm. Single-sided swingarm: The rear suspension of the new Hypermotard family relies on the exclusive die-cast aluminium single-sided swingarm, which has been specially designed to provide strength and guarantee excellent control of the rear axle. This elegant mechanical solution helps emphasise the bold and sporty character of the new models. New Testastretta 11°: The new Hypermotard family has left the 2-valve configuration behind to adopt a new 4-valve engine with a water-cooled cylinder, featuring a bore x stroke of 88 mm x 67.5 mm designed to achieve a perfect balance between usability and performance: this is the new 821 cc Testastretta 11° engine which provides maximum power of 110 hp @ 9,250 rpm and torque of 89 Nm @ 7,500 rpm. The new Testastretta 11° adopts technical solutions which directly reflect Ducati's engineering know-how and have led to the creation of an extremely fluid and stable engine: the 11° valve overlap confirms the excellent results obtained in the Multistrada 1200 family and improves the exhaust and intake stages with consequent steady operation at medium and low speeds. The relocation of the fuel injectors, which was also applied to the engine of the new Multistrada 1200, aims the jet of fuel directly at the hotter rear end of the suction valve, so that all fuel is atomised; a secondary air system similar to that of the 1199 Panigale enables the engine's operation to be optimised thanks to the controlled flow of oxygen which reduces cyclical combustion dispersion, thus effectively eliminating unburnt fuel. Ultimately, Ducati has managed to obtain a new engine that is extremely enjoyable, performs excellently and which can significantly limit emissions of unburnt fuel. Power modes: The Ride-by-Wire system, which is present on all the models in the Hypermotard family, allows 3 different engine mappings to be used to control torque and power: 110 hp with sporting "HIGH" torque 110 hp with progressive "MEDIUM" torque 75 hp with progressive "LOW" torque The structural features of the new 821 cc Testastretta 11° engine, together with the use of the Ride-by-Wire system which controls the opening of the butterfly valves on the basis of the input received, are the starting point in obtaining the Riding Modes for the new Hypermotard models. Each Riding Mode has a preset engine mapping, but can be adjusted and customised to suit rider needs. Exhaust system: The 2-1 exhaust system has been completely redesigned with 50 mm exhaust headers and valves which flow into the new single silencer made with a very compact, high absorption technology with a black finish and stainless steel rear frame. The system includes a catalytic converter and two lambda sensors, to guarantee complete compliance with Euro 3 regulations. APTC clutch: The new engine is equipped with an APTC oil bath clutch with ‘slipper' function which can be activated with reduced force on the lever. Its design uses a progressive self-servo system with plates with a high wear coefficient and this increases the torque available, with all other factors being constant, and hence reduces clutch spring loading and, ultimately, loading on the lever. All the models are now equipped with cable-clutch control; this has proven the best solution for this application in terms of build simplicity. The slipper function intervenes when the drive force is reversed and reduces the pressure on the clutch discs and so enables the vehicle's stability to be maintained during aggressive changes typical in sports riding. Service interval of 30.000 km: Thanks to the constant investment by Ducati in quality and reliability, the new 821 cc Testastretta 11° engine has enabled further progress in maintenance planning: valve adjustment is now scheduled for every 30.000 km which is a great advantage for Ducati customers. Touring equipment: Designed for travel outside urban centres, Ducati has equipped the Hyperstrada with robust, semi-rigid side bags, but which are at the same time light and stylish. The bags have a capacity of 50 litres and can be easily removed, making them particularly convenient and practical. The presence of a centre stand, on the other hand, increases the stability of the motorbike under full load. Special consideration has been given to riders who wish to share their travel experience with a passenger and a special wider seat has been built, with thicker foam support to increase comfort on long journeys. To this are added passenger grab handles that enable a wider and safer grip for excellent stability. 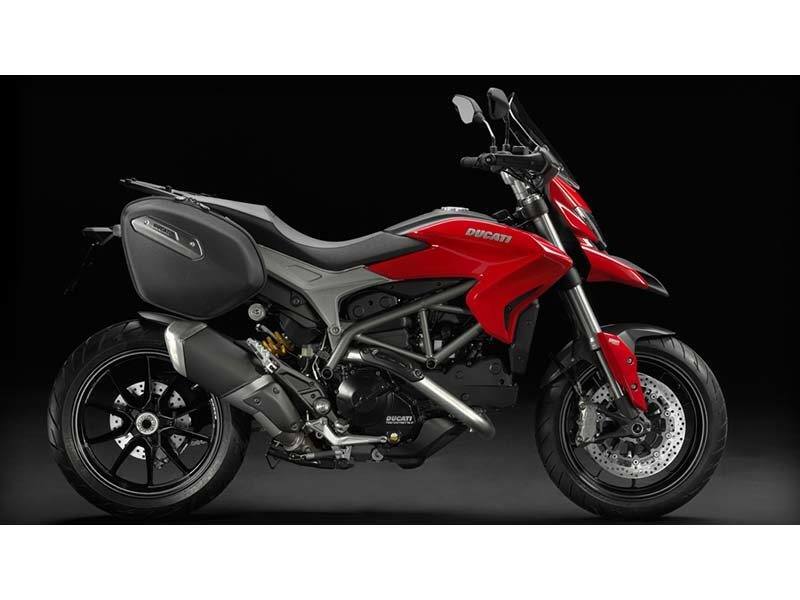 ABS Bosch 9MP: The new Hypermotard family is equipped with the latest Bosch 9MP ABS, an integral part of the Ducati Safety Pack. This unrivalled combination of safety and braking power provides shorter stopping distances and greater stability under braking. The system integrates perfectly with the Riding Modes and has two operation levels. Level 1, for Sport Riding Mode, ensures high braking performance with reduced anti lift-up control for sport use on the road. Level 2, for Touring and Urban Riding Modes, offers excellent stability on braking and maximum control over rear wheel lift. Riders who wish to try out unassisted braking performance can disable the ABS from the instrument panel menu. The ABS will remain disabled at the next key-on and this setting can be stored for each Riding Mode. Ducati Safety Pack (DSP): The whole range of the new Hypermotard family is equipped with the Ducati Safety Pack (DSP), which highlights the extent to which Ducati is focused on the issue of road safety. Designed to maximise the control of the bike and active safety while riding, the DSP includes the Brembo braking system with Bosch ABS in its latest 9MP version, and 8-level Ducati Traction Control (DTC). Riding modes: The Ducati Riding Modes mark a turning-point in motorbike engineering and allow a choice to be made, depending on the model, from preset modes to optimise the vehicle’s performance on the basis of the rider’s riding style and the environmental conditions. The new Hypermotard and Hyperstrada models offer 3 Riding Modes which are programmed to instantly change the engine torque and the intervention levels of the ABS and Ducati Traction Control even while riding: SPORT: The Sport Riding Mode provides 110 hp with a direct response from the RbW on acceleration, reduced intervention from the DTC system and the level 1 setting (high braking efficiency) from the ABS with reduced control over rear wheel lift. TOURING: The Touring Riding Mode provides 110 hp with a more gradual response from the RbW on acceleration, greater intervention from the DTC system and level 2 braking efficiency from the ABS with maximum stability on braking and lift-up control. URBAN: The Urban Riding Mode provides 75 hp with gradual response from the RbW on acceleration, even greater intervention from the DTC system and level 2 braking efficiency from the ABS with maximum stability on braking and rear wheel lift control. Instruments: The compact instruments of the new Hypermotard family include warning lights in the upper part of the dashboard for signals relating to neutral, indicators, high beam, rev limit, oil pressure and fuel reserve, while the lower section includes an LCD display with a DOT-matrix readout to view all the other data. The display provides data on speed, revs, mileage, trip 1 and trip 2, engine coolant temperature, ambient temperature and the time. In addition, it shows current fuel consumption, average fuel consumption, average speed and journey time. The DOT-matrix readout permanently shows the chosen Riding Mode and the corresponding ABS and DTC levels set; it is possible to choose from 3 Riding Modes very easily whether stationary or on the move using the indicator button. Controls: The integral Ride-by-Wire system on the new Hypermotards includes a new and compact electronic throttle control, which combines perfectly with the minimalist design of the displays. 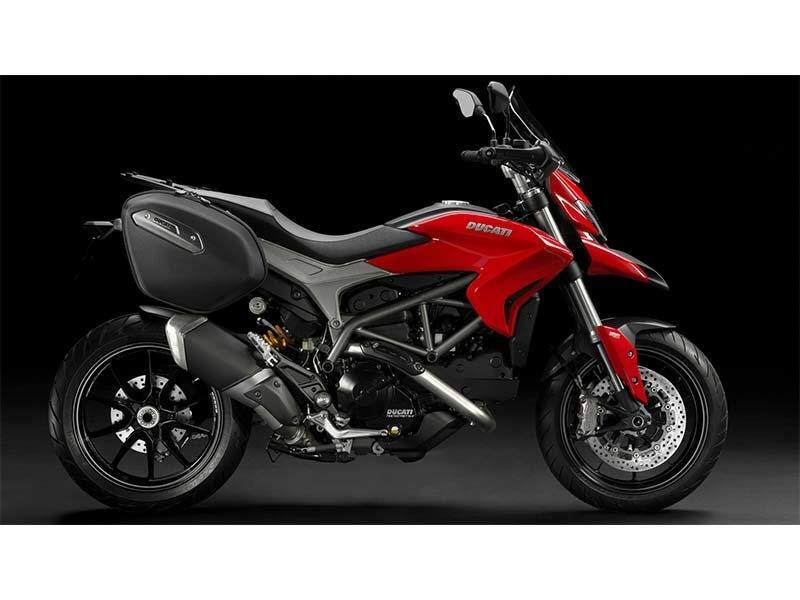 The Hypermotard uses the innovative display which features an exclusive ‘safety' function which protects the starter switch when the engine off button is pressed. For all the models the clutch has traditional cable control and, for the rear brake, a lever that can be adjusted in 4 positions (5 positions for the SP model with radial brake master cylinders). The die-cast aluminium foot pegs are painted black and have integrated heel guards and support the brake and gear change footplates made from forged aluminium. 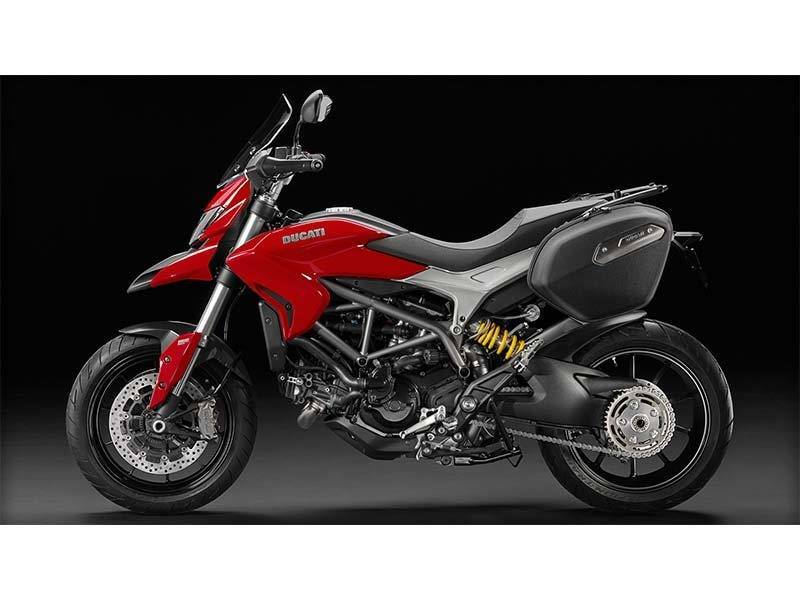 10-spoke sports alloy wheels: The new Hypermotard and Hyperstrada models boast the latest cast-aluminium 10-spoke wheels, with a design inspired by those of the 1199 Panigale, a clear expression of Ducati's unmistakeable sporting spirit. Power outlets: The new Hyperstrada has two 12 V power outlets, one on each side just below the rider's seat. They supply loads up to a total of 8 A (fused capacity), including heated riding gear, intercom, mobile battery charger and navigating instruments. 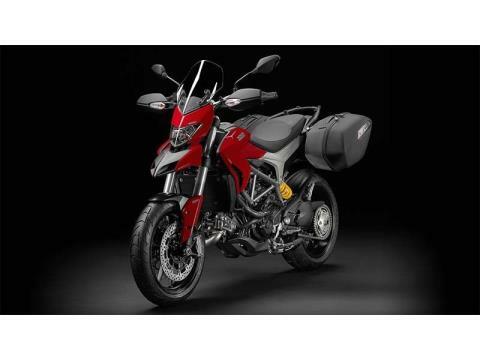 Pirelli Scorpion Trail: The Hyperstrada's ability to tackle long distances is also shown in the choice of its tyres. The new tourer in the Hypermotard family, just like the new Multistrada 1200, has Pirelli Scorpion Trail tyres as standard which, thanks to a mix of the latest components, guarantee excellent traction in all weather conditions and superb fuel efficiency. The front wheel takes a 120/70 x 17" tyre, while the rear has a 180/55 x 17" tyre. Truly versatile: Adapt the Hypermotard exactly as you wish and take the motorcycle just where you want. By fitting one of the specially designed additional packages, your Hypermotard will adjust perfectly to your needs and improve your experience thanks to specific accessories featured in each package. Whether it requires a sporting touch, the convenience of touring fixtures or clean urban design, the Sport, Touring and Urban packs are the ideal complementary package. Sport pack: Keep the fun bubbling and the adrenaline flowing with a set of essential accessories for a more sporty feel. Take the motorcycle to a new level with a Termignoni low exhaust using high-quality titanium and carbon components. Get the feel for increased performance and enjoy. The package contains a kit of racing footpegs, an adhesive carbon tank protector and low silencer kit homologated for EU countries as well as the USA and Canada. Touring pack: Map out your trip and kit out your Hypermotard with a selection of features designed to ensure even more comfort and greater convenience for both you and your passenger. More space for more destinations and integrated solutions for colder climates. The package includes heated handgrips, passenger grab handles, a tank bag kit and a top case kit. Urban pack: Skip into town with your bike and make urban commuting a pleasure. A package featuring components conceived for city dwellers will turn your Hypermotard into the perfect companion on city streets. The package contains a carbon fibre rear mudguard with an eye-catching matte finish, a racing number plate holder for extra zest and a high-security anti-theft system. Front: 10-spoke in light alloy, 3.5 x 17 in. Rear: 10-spoke in light alloy, 5.5 x 17 in.